Use wand applicator. Scoop a small amount onto hands and massage into body after bathing, paying closer attention to neck lines, chest, arms, and legs. Peptides provide visible reduction in the look of wrinkles with twice daily use. If there was an award for best texture of a body product, this weightless, whipped mousse would take home the medal. This product is amazing! Smells oh so yummy and is whipped to perfection; feels great. I really love this product. It is kind and gentle to my sensitive skin. The scent is heavenly and the mousse leaves my skin feeling fresh and moisturized. Love the scent/feel of this product. I never knew that lotion could glide on so smooth and not be oily, and also last all day long. I have found my new favorite, thanks to the American Beauty show in Chicago this past weekend. After I got home, I regretted not buying more, and placed another order online. Definitely my new favorite brand, and the Moon Dip is by far my most favorite product, so far. I have several of the FHF lotions and love them all. The moon dip is definitely a favorite and worth every penny. At 51 years old, I don't remember my skin ever looking or feeling better as it does now. 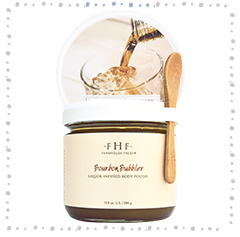 FHF offers lots of products and I love them all. This moon dip is one I don't want to be without! So rich and luxurious. Makes my skin feel nourished. Will purchase again. Oh Magic Wand of Moon Dip how my skin loves thee! Hand's, neck, chest, arms, legs, tummy, even little toes are all transformed by this advanced body mousse. The feel is pure airy fluff, like a fine whipped cream, which glides and melts into your skin, moisturizing and making you glow. It absorbs rapidly, no waiting to get dressed with Moon Dip. Only skin which feels like velvet when your done. The cute little wand adds just the right amount of whimsy to give it that something special feeling. Say bye-bye to the annoying red bumps on the back of your arms, so long to the rough knees and flaky calves. Hello to the softness that is gentle enough for a ladies decollete. All this in 4 days of use; even my husband noticed a difference. Leaves a very soft gentle barely there scent that smells clean and fresh. 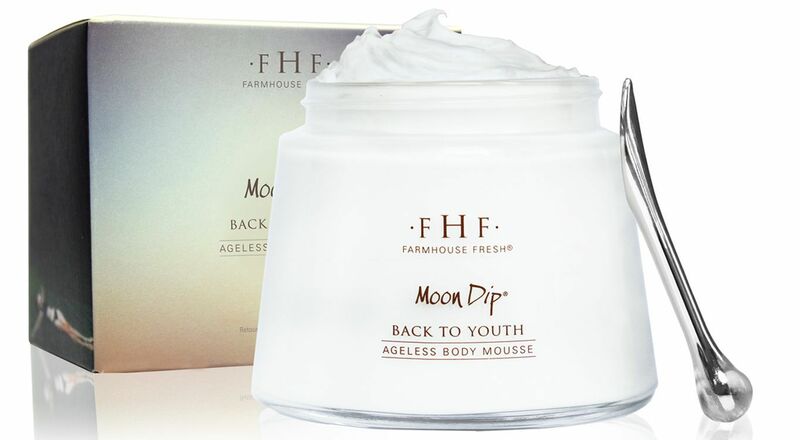 The Moon Dip Back to Youth Ageless Body Mousse melts in your skin. Works great on face under makeup. Also works great for dry hands while typing away at work. There is no greasy feeling at all which is why I like The Moon Dip. 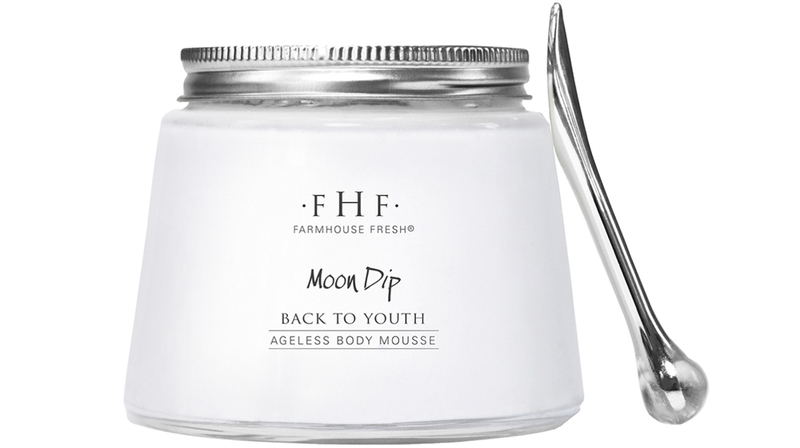 I recommend The Moon Dip to all ages. The fragrance smell is wonderful and lite and not overpowering. Love how easily this absorbs into my skin. I have never used anything like it. And the scent is so light but amazing!!! Highly recommend this moisturizer!!! This cream is amazing. Not only does it smell amazing but it feels amazing too. This is very moisturizing and tightening which I love. I have only been using it a short while but my skin just loves this. I have been putting it on morning and night and taking extra care around the neck and decolletage and am noticing a difference already. Highly recommend this product. At age 53, I decided to STOP neglecting my aging skin & take some serious measures to minimize any further damage. I have been using the Moon Dip Body Mousse as part of my new FHF skin care routine, along with the Lavender & Honey Body Polish, both day and night for two weeks and my skin hasn't felt this soft & glowing since I was a younger girl. It truly has transformed my skin. So glad I discovered your products. High quality ingredients that work! Thank you! I was skeptical to try this because I wasn't quite sure about a mousse, but I love it! It's not quite a lotion but not like a cream either. Leaves skin soft and the smell is amazing! This is a great product. I use it on my neck and arms. It has a very nice subtle scent. Is not greasy. Goes on very smooth. LOVE LOVE this product. Not to thick & smells good. I've had a for about 3 weeks & this bottle won't end on in the junk pile of products I wished I hadn't purchased. Try it! Love it! Makes my skin feel smooth and absorbs well. Smells wonderful! This stuff is great. I use it on my face, neck and hands. It smells wonderful, goes on great, smooth but doesn't leave my face oily. Can be used under makeup with no problems. I also use it on my 2 yr old hairline when it gets dry and flaky. He has sensitive skin and it works perfect. We have this in our retail at the spa I work in Avalon and everyone loves it. The fact they they are putting retinol in a body moisturizer is awesome. Our skin is on more than just our faces!! Not only that but we love suggesting it to our brides for wedding day as it imparts a light diffusing skin perfecting glow. It is light and fluffy and not too sweet smelling. It really is quite lovely. Just make sure not to go lie out in the sun with it on. Better used for those date nights!! Best lotion I have ever bought! 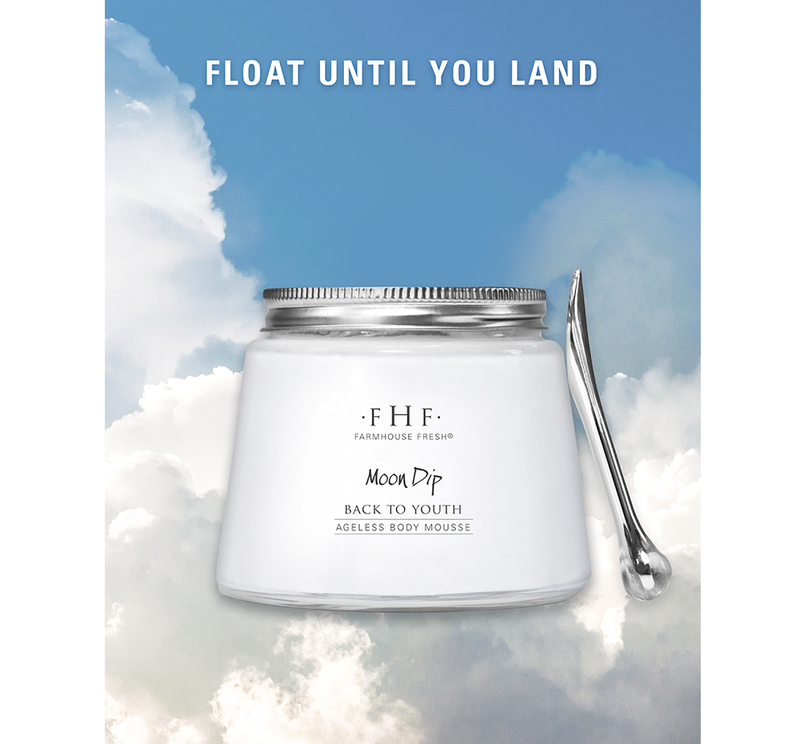 I have been using Moon Dip for a year now. Twice a day and my arms look 100% better than a year ago. This is the only product that has worked on my arms. No more wrinkles! I use it on my neck too! Amazing! The Gym in a Jar ! I absolutely LOVE this stuff!! I have extremely dry skin, Texas & winter doesn't help. I have been wanting to try FHF for awhile, why oh why have I waited so long! 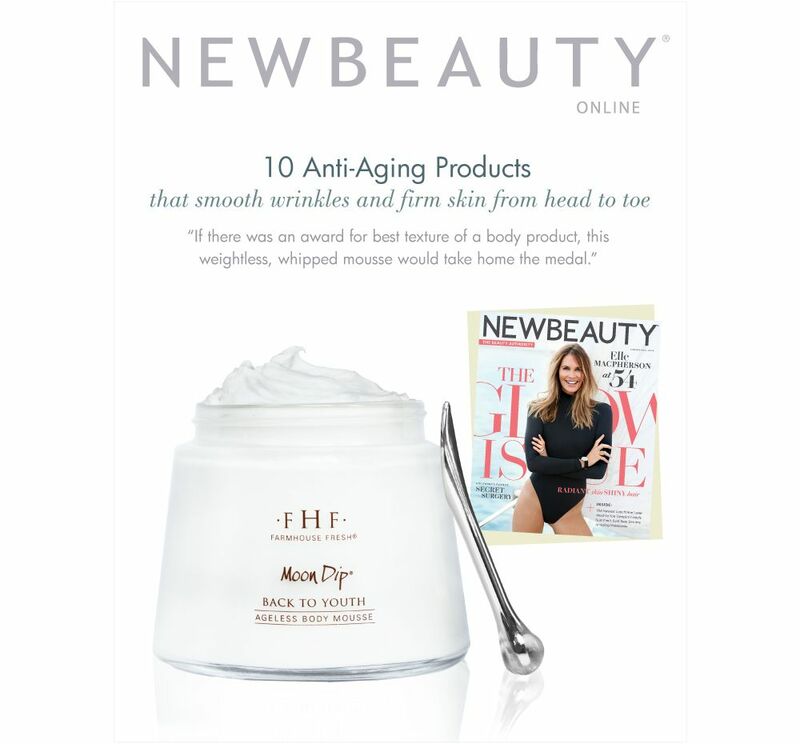 I will never be without this yummy, firming, delicious skin transformer! I just used my code and purchased 2 more jars .... I had a tumor 10 years ago, had to cut me hip to hip, always had very firm abs even after 3 children, it was emergency surgery so the cut was crooked...even though it was bikini cut as years went by it started to sag where the cut was and I'm very self conscious of it! One use of MOON DIP and i noticed a firming of this area, (I thought i was imagining things) I'm on one week now and it is not even noticeable now O.M.G I'm over the Moon DELIGHTED! Neck is firm, chest is firm, thighs firmer, bottom firmer!! What in the world is in this?! Skip the gym membership, buy this instead You wont regret it...bigger Jar please & the SCENT IS TO DIE FOR!!! Can we get a spray or a perfume in this scent PLEASE! 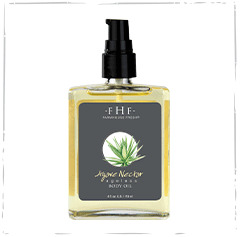 Agave nectar came last night, identical scent love! I am 55, very Dry skin, sun lover, for reference..
Never going back to anything else! Moon Dip is incredible! Non-greasy, leaves skin feeling silky smooth and the scent is pleasant and delicate. Convinced I'm never going back to any other body moisturizer! This product is absolutely the best! I love this stuff. It feels so good. No greasy feeling. I let my granddaughter try it and she loves it too. Love the richness of this Mousse. It feels decadent and at the same time nourishing. My daughter bought this for me for Xmas.... The first time I tried I was simply amazed. My legs and arms felt like wow!!! 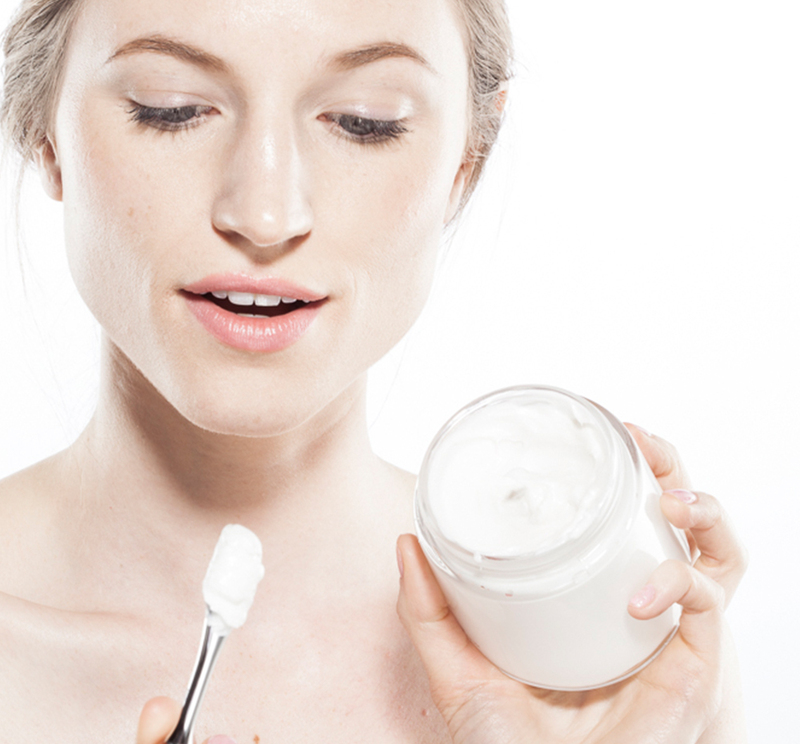 Immediately you could feel the rich smooth light cream sinking into your skin. I began using it morning and after nightly shower.. I would highly recommend this as a daily regiment.. really loved this! I absolutely love this moisturizer! It has a great scent and amazing texture. I have noticed a difference in the texture of my skin since using it. I highly recommend this product! I absolutely love this creme!! I started to get a little crepe skin on my neck (EEEEKKK!!) Well in 1 week of using this am/pm my crepe skin is GONE!! And the rest of my chest looks fabulous! LOVE the scent too!! !